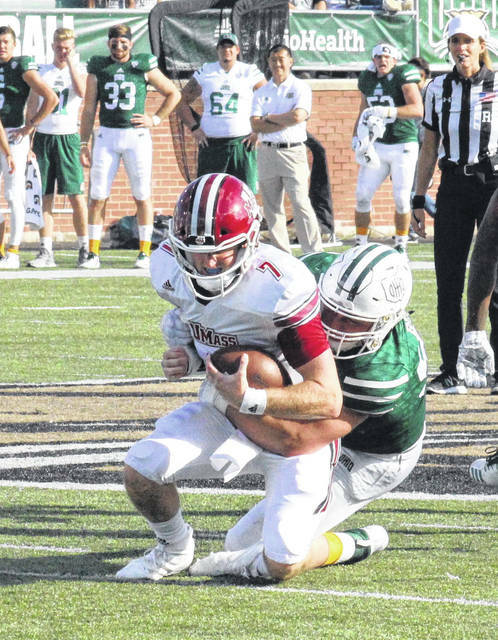 Ohio tight end Conner Brown (83) breaks away from a UMass defender, during the Bobcats’ win on Sept. 29 in Athens, Ohio. Ohio senior Kent Berger sacks UMass senior Andrew Ford (7), during the Bobcats’ victory on Sept. 29 in Athens, Ohio. DeKALB, Ill. — A battle fitting of their mascots. 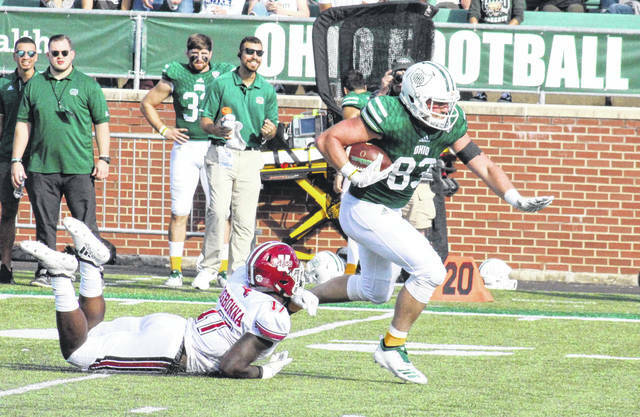 The Ohio and Northern Illinois football teams exchanged the lead four times in Saturday’s Mid-American Conference contest in the Prairie State, with the Huskies pulling out a 24-21 victory over the visiting Bobcats. Each defense started the game by forcing a three-and-out, and the Huskies (4-3, 4-0 MAC) put the game’s first points on the board in their second drive, with Andrew Grantz capping off a 16-play, 77-yard drive with a 36-yard field goal. After another punt by each side, Ohio (3-3, 1-1) took a 7-3 lead with 8:39 left in the first half, as A.J. Ouellette rushed in from two yards out and Louie Zervos made his first of three extra points, capping off a nine-play, 92 yard drive. Northern Illinois answered 1:58 later, as D.J. Brown broke a 28-yard touchdown run. The Huskies failed a two-point conversion run, however, keeping their lead at 9-7. Defense controlled the remainder of the half, as the two teams combined for four punts and 10 yards, leaving the Bobcats with a two-point deficit at the midway point. The Bobcats turned the ball over on its first two drives of the second half, but the Ohio defense came up with a pair of three-and-outs to start the third quarter. The guests began their third possession of the half on their own 15, but on the fourth play of the drive, Nathan Rourke tossed a 56-yard touchdown to Isiah Cox, giving the Bobcats a 14-9 lead with 6:39 left in the third. NIU punted for the fifth consecutive drive, giving the Green and White the ball on their own 10. Ohio needed 11 plays to cover the 90 yards, with Connor Brown grabbing an 11-yard touchdown pass from Rourke on the final play of the third quarter, giving Ohio a 21-9 advantage with 15 minutes to play. The Huskies ended their scoring drought on the ensuing drive, covering 77 yards in 12 plays, with Marcus Childers finding paydirt from 10 yards out. Gantz made the point-after kick, cutting Ohio’s lead to 21-16 with 10:38 to play. The turnover bug took its third bite out of the Bobcats at the NIU 47, with Sutton Smith recovering a fumble for the hosts. Six plays later, Marcus Jones gave the Huskies a 22-21 lead with a two-yard touchdown run. Max Scharping followed with a successful two-point conversion run, giving the hosts a 24-21 edge with 4:51 to play. The Bobcats went three-and-out, and never got the ball back, as NIU sealed the three-point win. The Huskies earned a 25-to-19 advantage in first downs, and a 400-to-321 edge in total offense, including 255-to-46 on the ground. Ohio punted five times, twice fewer than NIU, but the hosts won the turnover battle by a 3-0 tally. OU was penalized six times for 59 yards, while the victors were sent back 109 yards on 12 flags. Rourke — who was sacked four times — was 15-of-23 passing for 275 yards and two touchdowns, while rushing for a net of zero yards on 10 carries, after gaining and losing 40 yards. Maleek Irons led Ohio’s ground attack with 30 yards on 11 carries, while Ouellette picked up 16 yards and a touchdown on his 11 rushing tries of his own. Papi White caught a team-high six passes for 59 yards, while Cox grabbed three passes — including a touchdown — for a game-high and career-best 147 yards. Cameron Odom caught three passes for 54 yards, Brown added two receptions for 11 yards and a score, while Irons caught one four-yard pass. Javon Hagan led the Ohio defense with 10 tackles, including four solo. Evan Croutch and Kent Berger earned a sack apiece for the Bobcats, with Dylan Conner and Will Evans both recording a tackle for a loss as well. Jamal Hudson had a team-best three pass break-ups in the setback. For NIU, Childers was 17-of-33 passing for 145 yards, while leading the team with 169 yards and on touchdown on a game-high 23 carries. Jauan Wesley led the Northern Illinois receiving unit with six grabs for 61 yards. Kyle Pugh had a team-best nine tackles, including eight solo for the victors. Sutton Smith recovered two fumbles, earned two sacks, and 2.5 tackles for a loss, while Josh Corcoran and Jordan Nettles added a sack apiece. Trayshon Foster had the game’s lone interception for the Huskies. Ohio falls to 10-12 in all-time meetings with Northern Illinois, including 3-3 under head coach Frank Solich. The Bobcats return to Peden Stadium at 2 p.m. on Saturday against Bowling Green.